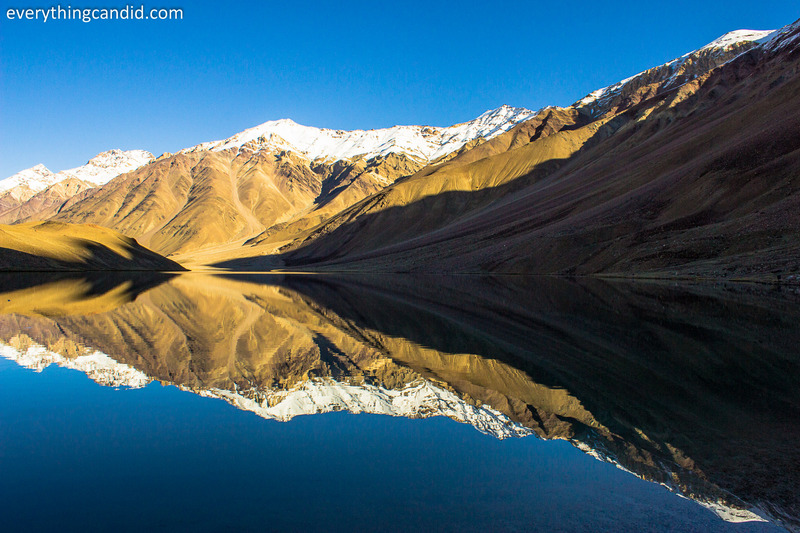 Awesome & beautiful Chandratal Lake! Serendipity is an awesome word in Dictionary and it has a lot many metaphors. For an explorer it’s the dream word which gives “kick” and such happenstance defines the purpose of traveling. But for me, after completing Spiti Valley via Shimla Kaza, Serendipity came alive in the form of Chandratal Lake in Lahaul Devision of Himachal Pradesh. Why I say so because when I was planning for Spiti Trip, Lahaul was not in my original plan as I finalized for Delhi Kaza to & fro via Shimla due to low ground clearance of my car. But as we were moving closure to the Kaza, people we met en route encouraged us to do full circuit and thus we crossed mighty Kunzum Pass and landed at Chandratal base station at the fag-end of our Spiti circuit. But story doest become a case for serendipity here as even after reaching this place which was only 4 KM from the Chandratal lake I was not willing to trek down to Chandratal Lake from base station because of two reasons, first as I was already a day late so wanted to leave early next day so that I could reach Delhi in time which was some 750 KM from Chandrataal Campsite and second I wasn’t willing to do this natural beauty in a hush-hush manner. But then again, many people at Base Station suggested, forced & encouraged us to do this and their vivid description of the lake made us finally to do it. And thus next day after spending a night at -6 degree we woke up at 6 AM and we did it as we were destined to do it. So, you would agree, I could witness this beauty only with serendipity at my side. 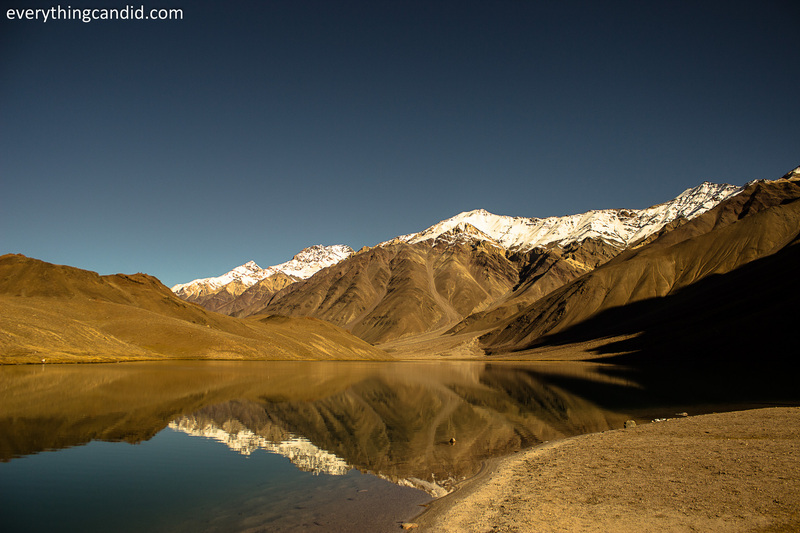 Chandratal which literally means moon shaped lake (Chandra means moon & tal means lake in Hindi) is situated at a height of 4270 meters and 8 KMs away from the Kunzum Pass in Spiti & Lahaul district of Himachal Pradesh, India and lies between a low himalyan ridge and the main Kunzum range. 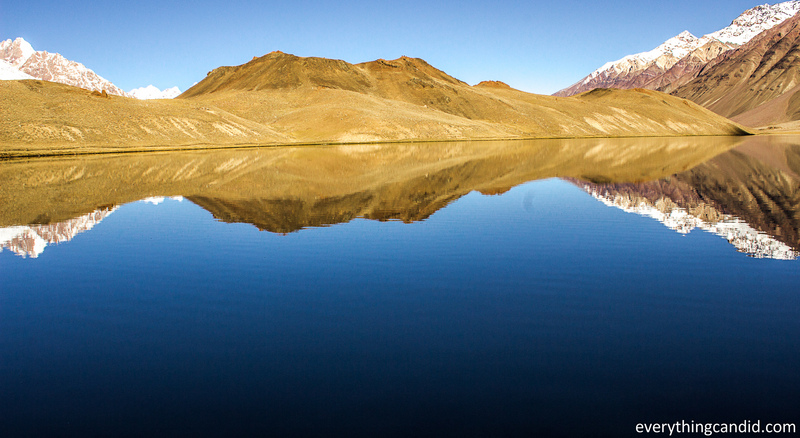 Boasting of a circumference of about 3 KMs, the crystal clear water of Chandra Tal Lake is one of the source of the violent Chandra river. After 6 days of road tripping from Delhi to Spiti Valley, we reached the base station of Chandratal after crossing over Kunzum Pass. 12 KM detour to Chandratal from Kunzum-Manali main road was literally the deadliest road that i covered in last 6 days. This so called “the road” is actaully a walking treck that has been widened to make it somehow motorable. On the wheels, i was literally sitting straight and manoeuvering between all-pervasive boluders/rocks & crumbly edges. I was really lucky to have done this steep inclines successfully with My Ford Figo driving at around 13000 ft. It’s almost like an off driving experience that too in high Himalayas. 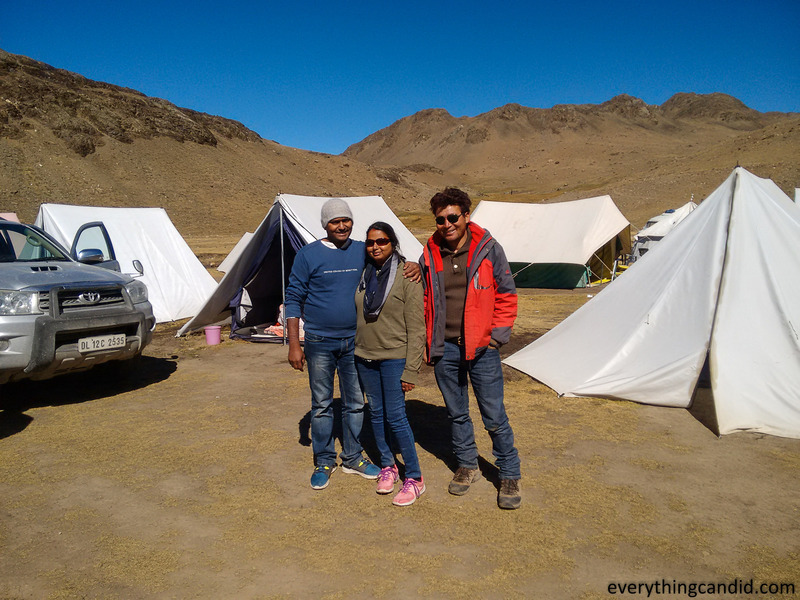 We stayed with Parasol Camping which is located 4 KM from Chandratal Lake and undoubtedly its the best campsite near Chandratal with all the amenities and run by awesome team of Mr. Bishen Thakur. 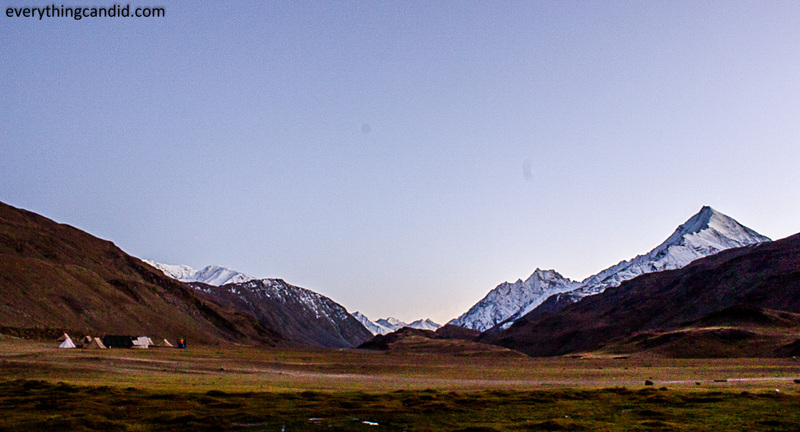 Near Chandratal, we camped at -6 degree temperature! After a lot of self cajoling, we finally decided to go to Chandratal next morning with a strict timeline of 2 hours for the lake. 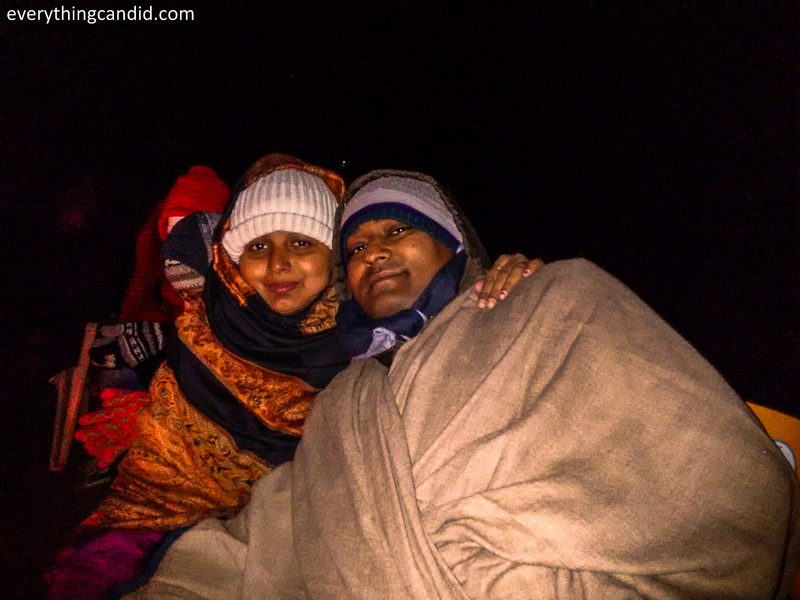 After spending my first ever night in sub-zero temperature at the base camp, we had to struggle a lot to get up and move out of layers of quilt and blanket. It’s a 2 KM drive up to Parking area and then a 20 min trek to the lake site. The first glimpse of this Lake was serendipitously beautiful for me. I found a romantic aura around it which simply and lovingly took me into its embrace and the warmth of this embrace changed every minute. 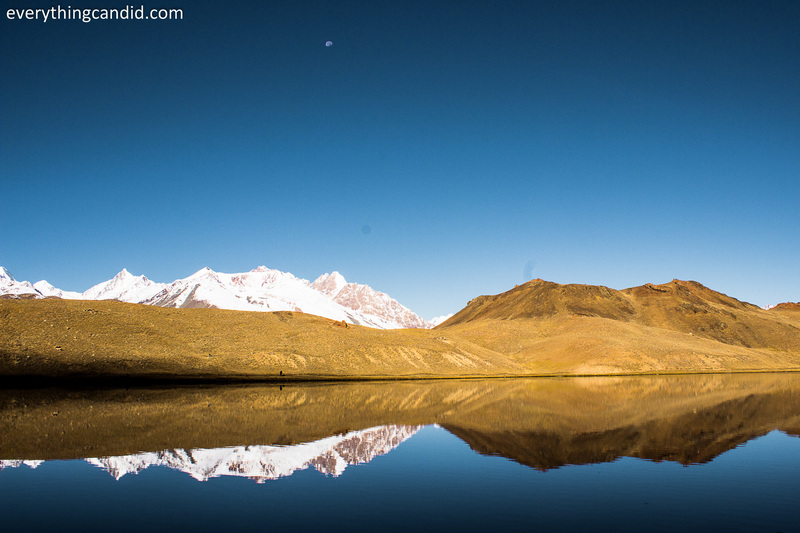 We reached their 20 mins prior to sunrise and was stunned with the reflection of snow-capped mountain on the water. But the real beauty and the expanse of this beauty was before us only when sun peeped out and thus the riot of the color were out making this lake an immense and nonpareil beauty. Every minute with rising sun throwing its rays on the large canvas of this lake, the reflections on the water changes color, hue and vibrancy. This magnificent lake, truly, celebrates the surprises and uniqueness that natures carved for a traveler. 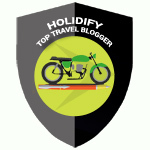 to offer to travelers. Being a Picean, water in any form attracts me ocean always enthrall me with its mighty vastness but when I sit next to any lake it imparts a distinct calmness and stillness in me which lasts longer compelling me never to get up. Enchantingly engrossing beauty that exudes from this lake makes you not to leave this place ever and live there forever. I literally wanted to spend a complete day here so that I could capture every hue and color of this lake and the reflections it creats, but had to part ways from this stunning place with a promise to come back soon. And today, when I am back and going through photographs, I feel Chandratal is the ultimate reward bestowed by Mother Nature on me for the efforts I put in to complete the Spiti Circuit. Yes indeed, after covering 1100 KM in rugged and tough Himalayan Roads, I could not have asked for more. Getting photographed next to Chandratal is the trophy that vouches for my efforts and spirit full of madness and adventure. Thanks Dada for your continuous encouragement! I think, this is one place, no image could do justice, something to be experienced by being there, right? Thanks for the awesome words and relating with the feelings. Indeed an awesome place and only can be felt byt visiting in person. And you got clear skies too! I walked for 14 km in 2014 as the road was broken due to a landslide. Only to find the whole place engulfed in cloud cover. I envy people who see it this blue without even really trying. 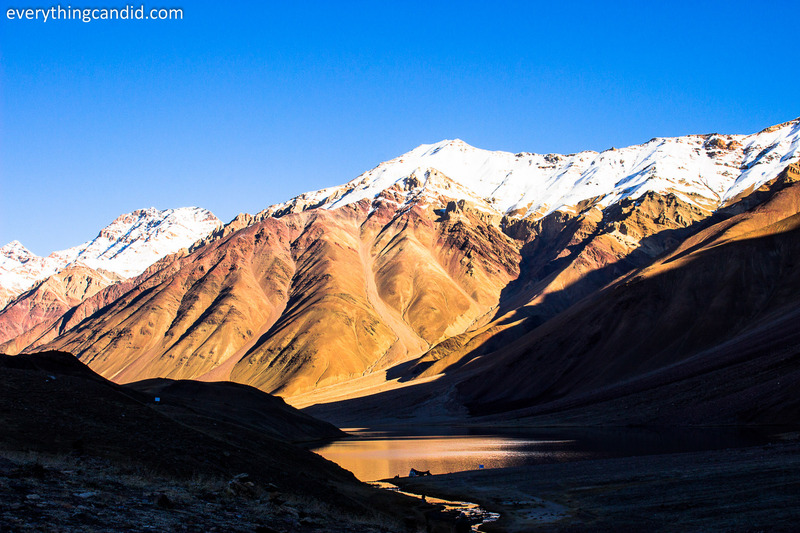 But i went thru your blog and loved the stunning pics of chandratal and spiti. Its always beautiful. Indeed. Glad that u like it. This place was indeed incredible. Thanks for lovely comments and continuous appreciation. Whoa! Stunning place and pics! I hope I have the luck to visit the place. Thanks Indrani. I am sure you would make it to this place. All the best. This would be such an amazing adventure. A perfect location with a breathtaking scenery? YES PLEASE! It was indeed most amazing place …. the closes to the heaven …. I’ve always written off Chandratal as one of those usual India travel list items that literally anyone and everyone has been to. But now I can see and understand the reason for its popularity! Looks like a wonderful place! Ohh certainly its an awesome place…and difficult access to this place makes it more charmimg! 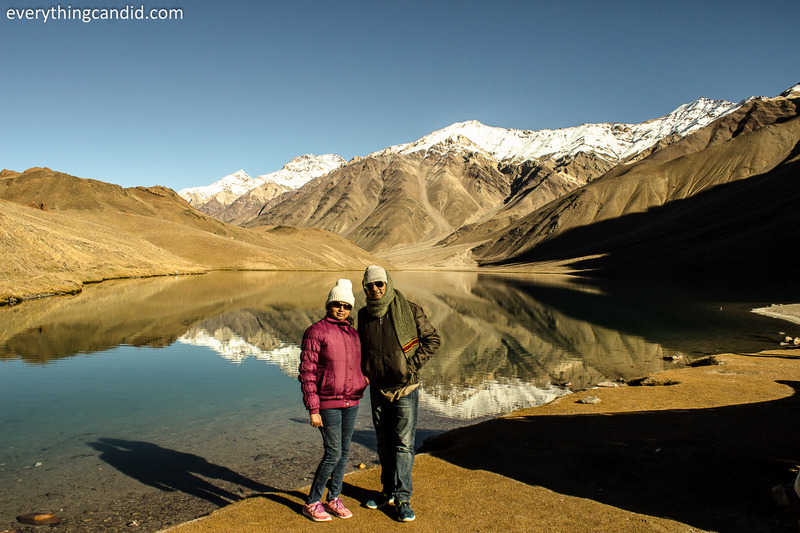 Love the pictures, certainly looks like you thoroughly enjoyed your time at the Chandratal Lake. Yes…. the time spent there will always be cherished. Thanks for dropping by and your feedback. You are so true.. i would certainly cherish every bit of this trip forever. Look forward to c u again and soon. Fabulous post and incredible photos! Makes me want to be there now! The Parasol camping grounds look like such a perfect location. I love scenic camping spots like that! Thanks for your encouraging words. 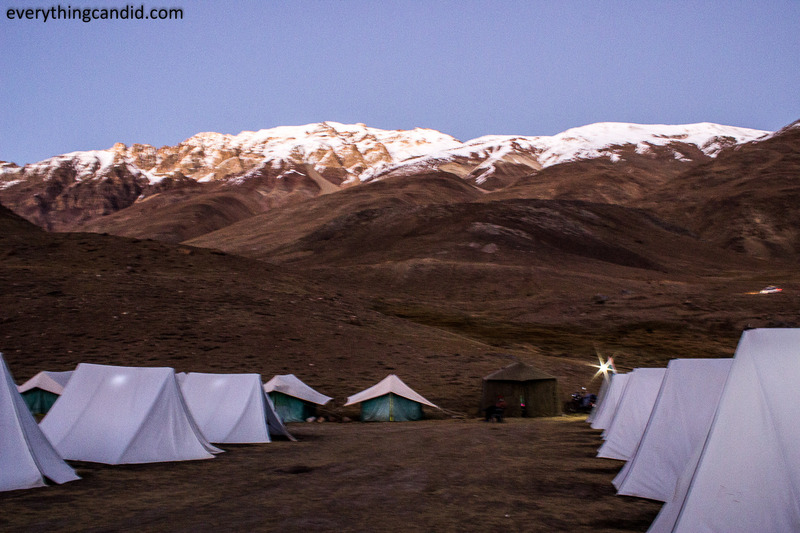 This base camp is one of the perfect camping locations in Himalayas. The view looks so serene. Its like a perfect place to camp out and just think about random things in life. Fabulous pictures by the way! Indeed, a place where you declutter your mind and think big in orderly way. Thanks for liking teh pictures. Really breathtaking! Just looking at your photos and I am excited as well. Glad that you like them and feeling excited. Place was really awesome and thrilling. Haha… would love to take you with us. But yes Himalaya with snow is is engrossing. Lets connect more often. It is absolutely beautiful! The mountains are just WOW! Eventually we will get there..
Its a real beauty…nature at its best. Glad to know that you want to be there. For any support feel free to connect. Your photos are, as always, spectacular. I’ve long since given myself over to the fact that the world often has a bigger plan for what we’ll end up doing or seeing. It’s funny how often some of the best laid plans don’t always go according to plan, and often the last minute additions to an itinerary or spur of the moment decisions end up being the highlight of a trip! Wooohoo… i feel great when a senior blogger like you appreciates. Thaks alot. Indeed, and for this reason i love self drive road trip so that i hv freedom. Beautiful captures Himanshu. You made me so very nostalgic! Thanks Rajiv. 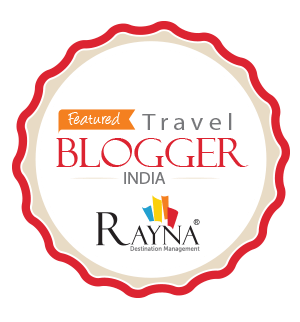 Do share your travel story. Please sennd the links. 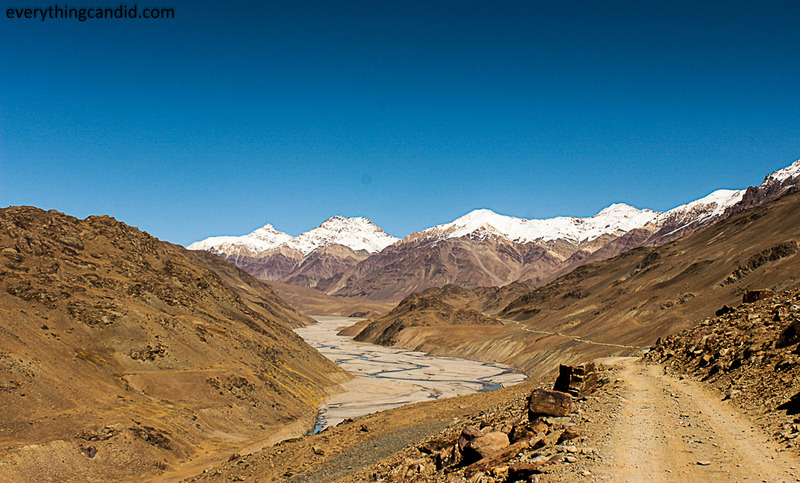 You can have a look at my blog at http://webguy.in for more of Himalayas! Would certainy read them. Thanks. I wouldn’t mind waking up and seeing this view again and again! Ha ha… once u are there… u want to get up early. Thanks. You just can’t beat unzipping your tent to this beauty. I can see why you were a little overwhelmed. So true. This is just an amazing place. Wow! How lucky were you to get such great weather. Some fantastic shots, I love the reflections. All worth it in the end! In one word Awesome. Great vistas. Loved the contrast between the turquoise and the beige. Great shots! Thanks for the comment. It was indeed riot of colors. Wow this sounds like an amazing adventure! Your photos are stunning. I just can’t imagine camping at -6 degrees. Sounds like it was worth it (and looks like you had a lot of blankets), but still — so cold! To me, mountains and lakes equals serendipity. 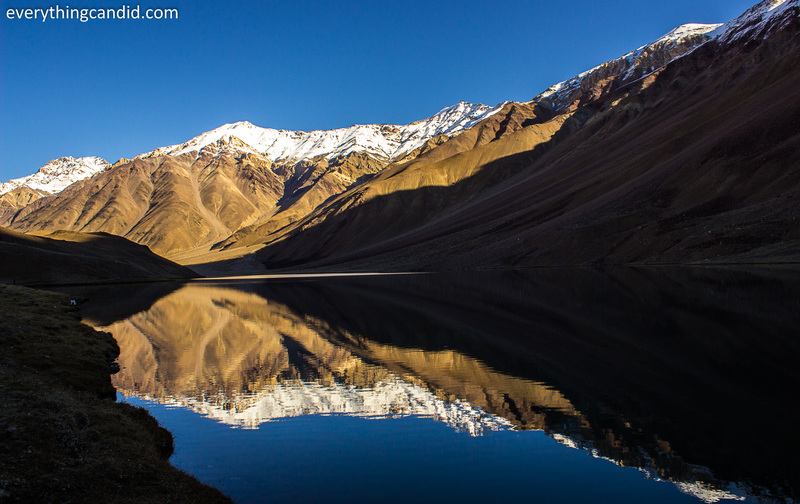 Your entire trip to Chandratal Lake looks awesome. I really hope I will be able to travel there myself one day. The camping with Parasol Camps is a great accommodation option that fits into the environment. Sometimes you gotta take the advice of other travelers and locals. I am glad you did because the pictures are amazing and you enjoyed it so much. -6 degrees sound so cold! The camp looks awesome though and well worth the cold nights. I would definitely camp and hike (something I am not used to do) to get there and enjoy this breathtaking view. 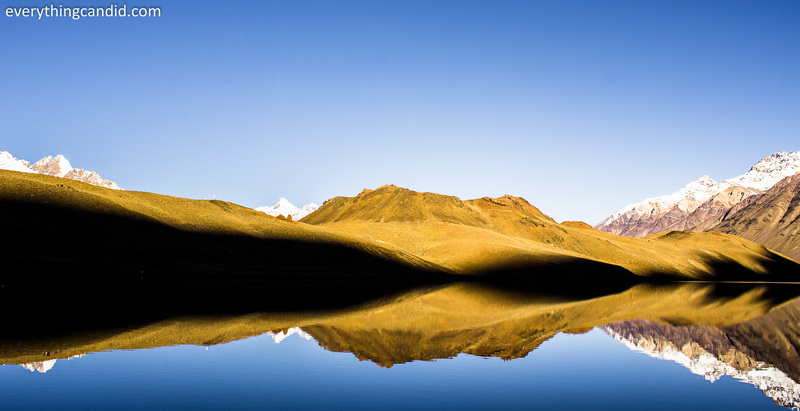 The reflections on the water of lake Chandratal make your photographs truly stunning. Great camping adventure you had there. Even at -6 deg. I’m sure you had a wonderful time being surrounded by nature. I love the lakes providing perfect mirror images of the mountains. The place even with the absence of trees looks gorgeous. 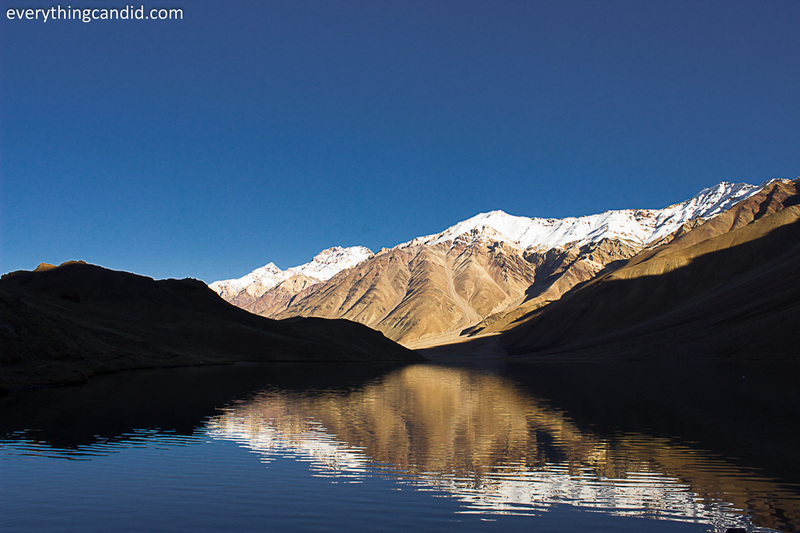 Chandratal Lake looks very stunning. It must have felt amazing being alomst alone there. I would love to see more from Himalayas! Definitely sounds like a serendipitous moment! 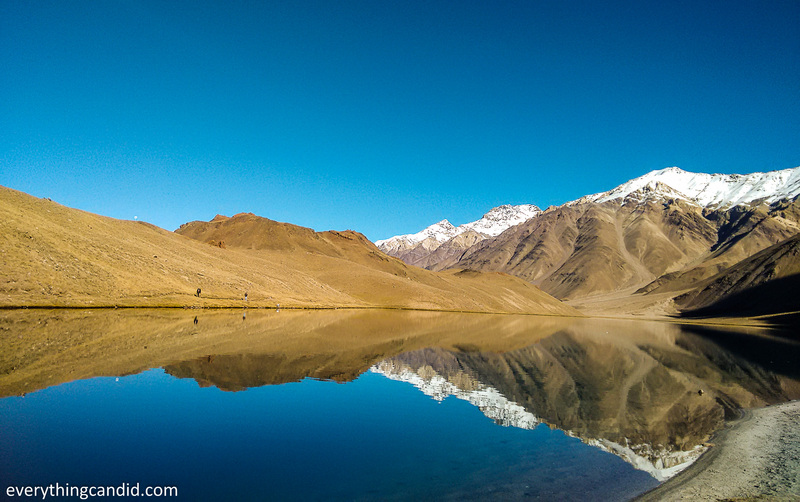 Chandra Tal Lake truly is magnificent – it sounds like cold camping to experience it – but so worth it! The reflections are seriously stunning – good decision to get out there for the sunrise photography! Ah, serendipity is one of my favorite words! And what an amazing trip you had. Your photos are incredible. The universe definitely wanted you to see that beautiful lake! Indeed. Thanks for your encouraging words.